The Pour Curator: A Customizable Can? 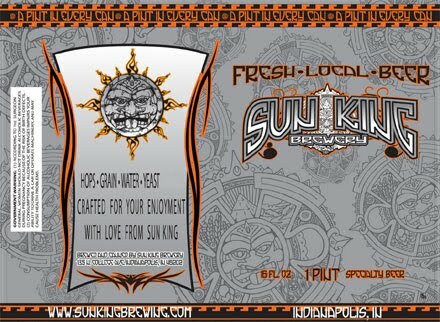 In news broken by Hoosier Beer Geek, it appears as though Sun King Brewing is trying to change the game of can label art by creating the first customizable can. The process will be a lot more labor intensive because we will have to adhere a label to each and every can before we run them through the canner, but we believe it will be worth it. This of course is a sad thing for this Pour Curator, because now there's less incentive to do design work, and Sun King was exhibiting some of the better can design. But it's a good thing for the brewery and beer people, because it gets more beer out there. And hey, maybe they'll get creative with their stickers. I'm a little surprised the TTB is okay with this, and there are of course potential concerns with transparency about abv, etc. I hope those 3"x3" stickers carry a lot of information, or else you'll have to know a lot about the beer before you buy it. But still, the development of a fully customizable can is interesting and significant from a design perspective, and potentially at least a mildly disruptive advancement when it comes to packaging beer in small batches. And nice reporting by the guys at Hoosier Beer Geek! Clay from Sun King here. Firs off, thanks for the props on our can design! Our artist does a great job and from the get-go art has been an important factor for Sun King. We appreciate your concerns about our new can and I wanted to address a few of your points. As far as the TTB is concerned, the can meets all federal labeling requirements. In regards to transparency about abv, there is no federal requirement for putting that information on the can (that's a state by state issue) and we plan to put that information on every beer, as we already do with Sunlight, Osiris and the impending Wee Mac. Each sticker for the specialty release will require further approval in order to maintain compliance with the TTB. The idea behind this new can is not to kill the development of future cans, but to give us an avenue to package some of our seasonal or specialty beer that until now have been draft and growler fill only. In the last year we have made over 50 different beers, some of which we have only done limited releases of and have been cellaring a decent amount because they deserve better than being put in a growler that won't allow you to cellar the beer or enjoy them in more than one sitting. We chose to can because we believe that cans are a superior vessel for the transportation and distribution of craft beer! So deciding to bottle seemed counter-intuitive to us... We hope to continue the development of our cans and introduce more varieties in the future, but one of the limiting factors about canning is that you have to buy them 150,000 at a time and the best you can hope to do is split that 150 and get 75,000 of two different types (which is what we initially did with Sunlight & Osiris, then again with Wee Mac & Specialty Can).